Click the button below to add the SmartCam-IP Camera-motion detection to your wish list. Why Install an IP Surveillance System? Installing a reliable surveillance system could be one of the best steps you ever take to secure your home or business. It helps protect against criminal activity and actively deters criminals from targeting your property. An IP surveillance system is simple to set up and has the added advantage of allowing you to view live footage remotely and securely over your local network or the internet. Should the worst happen, your IP surveillance system provides evidence in the event of a crime being committed. As well as providing information that can help prosecute the perpetrators it can protect you against litigation and false accusations. As the old saying goes “the camera never lies”. 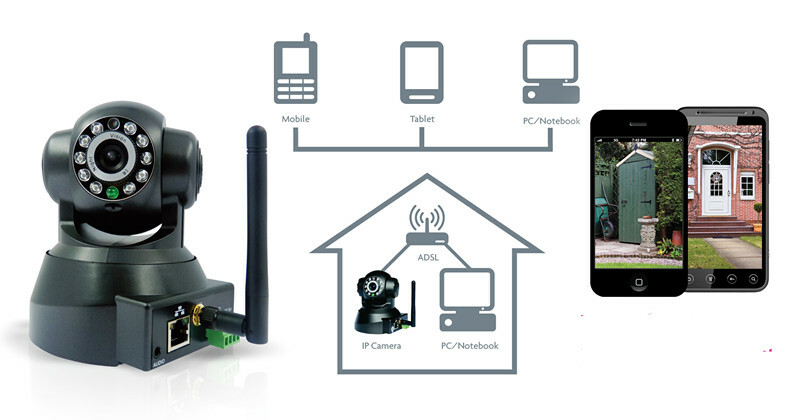 Why Choose a P2P Smart IP Camera? If you’re looking for a simple and low-cost surveillance system that allows you to access video and images on your PC or Smartphones, the SmartCam is a perfect choice. It combines a high quality digital video camera with network connectivity and a powerful web server, to bring clear images to your desktop from anywhere on your local network, or over the Internet. Setting up the camera typically takes less than five minutes from opening the box. The software supplied manages the set-up process for you. Includes support for dynamic IP address and DDNS and with wireless connectivity you don’t have to worry about running cables around your home or office. The camera is controlled via a built-in web server which supports Internet Explorer. Management and maintenance of the camera are also very simple as remote configuration, start-up and firmware upgrades can all be done via your web browser, over your network. The camera has a motorised pan and tilt head that you can control remotely via a web browser, allowing you to view a wider area of your home or office. It has a 270 degree pan (horizontal) rotation and tilt (vertical) control of 90 degree. With day and night vision, this camera provides clear images around the clock. Infra-red technology means that no additional illumination is needed to capture high quality video at night (up to 10m range). It transmits images at up to 30 frames per second on your local network or over the Internet using MJPEG compression technology for high image quality. This camera transmits remote video over your IP network so you can choose to view images on your desktop or smartphone in real time from anywhere on your local network, or over the Internet. Remote viewing software is available for iPhone, Android and Blackberry phones. So wherever you are in the world, you can keep an eye on your property with just a few clicks. A useful feature included with this camera is two-way audio. Not only can you hear whatever or whoever you are seeing on camera but you can also speak to them. This makes it ideal for speaking to staff or visitors who are in a different part of the building. The IP camera comes with sophisticated software that can detect movement. If your camera spots movement it can trigger an event to record video or still images. It can also send images directly to your mailbox when motion is detected so you don’t need to monitor the images all the time, you will simply be alerted should something happen. The system can be set up to only allow authorized users access to footage, so you can choose who can and cannot view the captured images. This keeps your recordings secure.